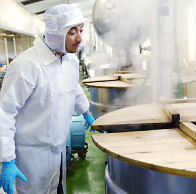 Section Takesan Foods Co., Ltd.
A worker pours in the seasoning, which contains a secret sauce. Rich-flavored local soy sauce forms part of the brew, giving the room a deliciously sweet and savory aroma. 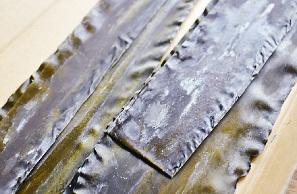 Thin strips of kombu (dried kelp) are dumped into boiling water and removed to a colander as soon as they change color. I took a peak inside this vat. The kelp was bubbling away in the sauce. Workers checked the color and appearance regularly, letting it stew for about an hour and a half until it was done. Japan has developed many foods that make great condiments for white rice. Tsukudani is one of them. 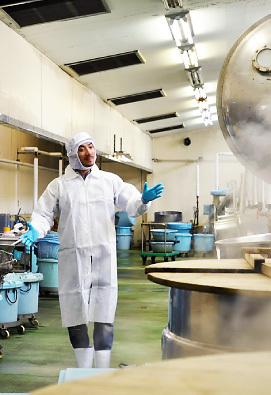 Takesan Foods Co., Ltd. is the oldest tsukudani maker on the island. 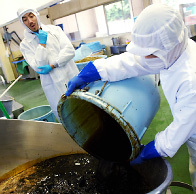 According to Ryuji Fukui, “Our company started making tsukudani precisely because we already produced soy sauce.” At the end of the Second World War, Takesan’s founder, Yoshiji Takebe, was looking for new things to do with soy sauce. He mixed it with some other ingredients and used the concoction to stew up a batch of sweet potato vines. That was the origin of Shodoshima tsukudani. 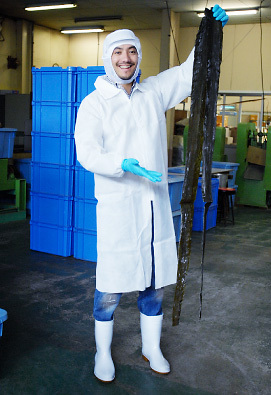 While I was there, the workers at the factory were bustling about enormous vats making kelp tsukudani. It’s flavored with soy sauce and sugar combined with Takesan’s own secret sauce, which they keep topping up over the years. “Our job is just to make sure the tsukudani has the same taste, texture and color as always,” the workers told me. They make it sound so simple but maintaining consistent quality is a highly refined art. I’m sure it’s their sharp eyes as they watch over the vats that have protected Takesan’s time-honored taste for so long. The plant is bright, clean and spacious. The vats are huge, big enough to make 120 kg worth of tsukudani. Most of the staff has worked here for over thirty years and are experts at maintaining Takesan’s signature flavor. The kelp is sorted once again by hand for width and thickness. The size determines what kind of tsukudani it’s used for. This strict attention to detail and careful checking occurs at every stage of the manufacturing process. This is the bottling line. Ginger tsukudani sales have really taken off and jar after jar comes down the belt. Many new varieties are being developed in addition to traditional flavored tsukudani. This machine chops the kelp into squares. Well, actually, a closer look reveals that the pieces are not square but rectangular. They’ll be square once they’re cooked because kelp swells as it is stewed. Takesan tsukudani brings out the natural flavor of all the ingredients. This means that the quality of the basic building blocks is just as important as the secret sauce and the manufacturers’ skills. “We use wide, thick kelp from Hokkaido,” Mr. Fukui tells me. 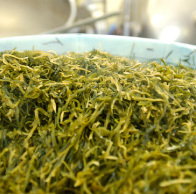 “For seaweed, we select only the best varieties, such as iwanori from the Amakusa region in Kyushu.” Safe and healthy, that’s their rule of thumb for selecting ingredients. Which explains why Takesan insists on additive-free tsukudani. Apparently tsukudani is also affected by food fads and trends. “So many people are health conscious now that we’ve increased our range of low-sodium tsukudani,” Mr. Fukui told me. I asked him what their most popular variety is, assuming that it must be kelp. To my surprise, he said it was ginger. I guess that makes sense because ginger is Japan’s latest craze. It’s believed to raise body temperature and increase immunity. Takesan has also developed versions made with tiny fish, butterbur, beef and other ingredients. It’s amazing how many variations there are. To be honest, I had never tried tsukudani before. Mr. Fukui insisted that I taste a freshly stewed batch of the kelp variety. I loved the texture and how the rich flavor of the soy sauce had permeated the succulent kelp. I definitely wanted a bowl of rice to go with it. Tsukudani is so diverse, there’s bound to be varieties that would be the perfect touch in Japanese-Italian fusion dishes. Aha! I think I might be getting an inspiration! Look at this magnificent piece of kelp. It’s as tall as I am. The qualities of tsukudani ingredients differ every year, depending on the weather and when and where they’re harvested. The manufacturers must make allowances for these factors when they make tsukudani. Characteristics: Domestically grown ginger stewed with dried bonito from Makurazaki, Kyushu. Shodoshima soy sauce gives the ginger a sweet, salty taste. Excellent not only as a condiment for rice but also as a topping for tofu and salads.